The new eye tech can effectively retard the progression of myopia by roughly 60% amongst HK children. According to a recent press release, The Hong Kong Polytechnic University (PolyU) extended its licence on Defocus Incorporated Soft Contact (DISC) technology to a local start-up. DISC and DISC-1 lenses, Source: HK PolyU, Press Release. The patented technology was licensed to the start-up in 2018 for commercialisation of DISC lens in Hong Kong. Following the extended licensing arrangement, the start-up will further promote the product to the cities in the Greater Bay Area and other parts of China in the future. Children and teenagers in the nation will also be benefited from PolyU’s research success in myopia control technology to address their vision health issues. The novel DISC technology, patented in the Mainland, Australia, the United States and other European countries, is a multi-zone soft contact lens that provides clear vision and at the same time projects blurred, out-of-focus (defocused) images onto the retina to slow down the increase in axial length of the eye of the myopic patients. The clinical control trial conducted by PolyU showed that DISC lens can effectively retard the progression of myopia by approximately 60% amongst Hong Kong children aged 8 to 13. DISC lens, launched by the start-up in Hong Kong last year, has received positive responses. To offer the myopic population an alternative, the start-up recently launched a daily disposable contact lens — DISC-1 Day. With the authorisation from PolyU, the start-up will collaborate with another vision care company to apply for licence application with the China Food and Drug Administration for DISC-1 Day in order to extend the DISC distribution to the Mainland. 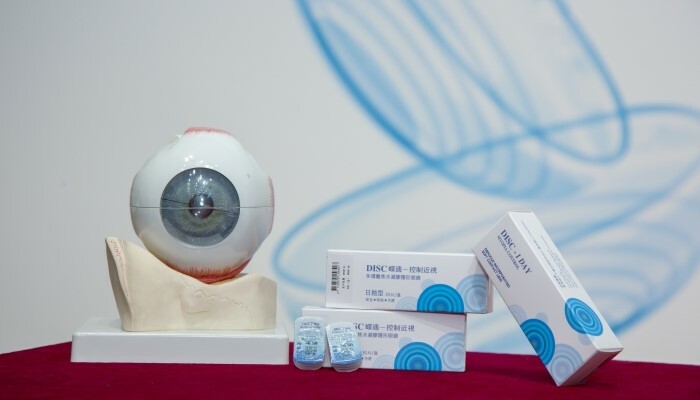 It is expected that with the licence granted by the Chinese authority, the brand new product will be distributed to the authorised optometric clinics and fitting centres within a year, initially in the Greater Bay Area, and gradually extending across the nation. 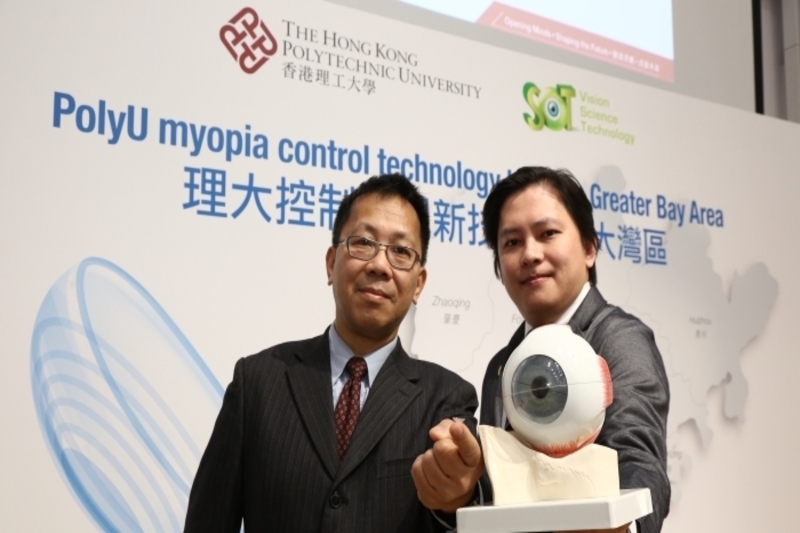 The Assistant Professor of the School of Optometry at PolyU stated that it is hoped that the innovative DISC technology, which has been successfully commercialised solution, can be brought to the Greater Bay Area and other cities in the Mainland to help the nation address the spiralling myopic problem among children and adolescents. The start-up was founded by a PolyU alumnus and received support from the HKSTP-PolyU Tech Incubation Fund (TIF) and PolyU Tech Launchpad Fund (TLF). It specialises in developing and distributing products for vision improvement and is the first company in Hong Kong that adopts a tailor-made professional fitting approach to manufacture and provide soft myopic control lenses. Under the licensing arrangement with PolyU, VST manufactures and provides DISC lenses via its authorised optometric clinics and fitting centres. The lenses are manufactured according to the prescription of optometrists. The Founder and Director of the start-up the brand new DISC-1 Day offers the myopic population more choices as it is readily available upon optometric fitting assessment, and is for daily wear and disposal without the need for care. With the power of myopia correctable up to 10.00 diopters, it is of the highest diopter with ultraviolet protection among all similar products in the market. The start-up was awarded a total of HK$1.6 million, including a matching fund, under TIF and TLF schemes. Both schemes are funded by the Technology Start-up Support Scheme for Universities under the Innovation and Technology Commission of the Hong Kong Government.